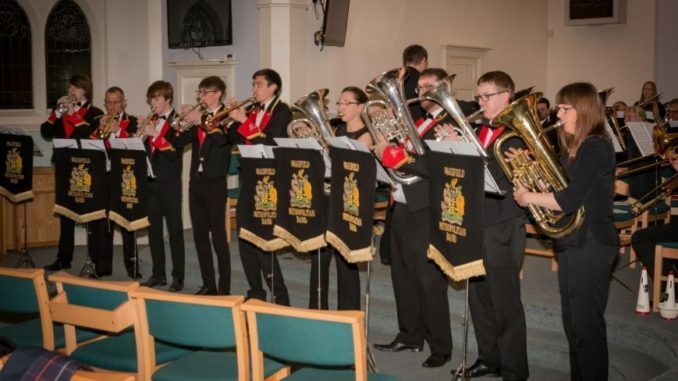 In his first evening concert since taking over as Musical Director of the Wakefield Metropolitan Brass Band, Peter Kench treated over 100 people to a wonderful evening of music both traditional and modern in the Sandal Methodist Church. Organised by Ray Spencer, from the Rotary Club of Wakefield Chantry, in aid of both the band and Rotary Charities, this was the eleventh annual concert by the band that Ray had organised. Over the years nearly £20,000 has been raised for the Band and charities. This year was one of the most successful ever and raised well over £1000. Solo performances by Louise Crook on Euphonium and Andrew Thompson on Horn had the audience spellbound, however it was the combined horn and euphonium sections rendering of the Lionel Richie hit, All Night Long that really brought the house down.